Seven Thursday Evenings 6:30 – 8:30 p.m. Session One consists of four brief conferences covering the topics of Prayer as Relationship, The Method of Centering Prayer, Thoughts and the Use of the Sacred Word and Deepening our Relationship with God along with a full Centering Prayer experience. A free-will offering to benefit the work of Contemplative Outreach of CT is requested. 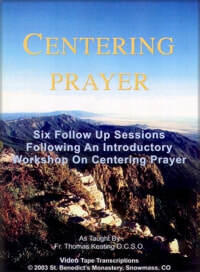 Bound copies of the Transcript to six facilitated sessions and other books about Centering Prayer will be available for purchase. For more information about this program please contact Gregory Kay by email at: gregorymkay@gmail.com​ or by phone at: 860-508-7434. Kindly Register for the Program below! Please let us know if you'll be bringing any guests. We ask you to invite others in your area to join us and be enriched!